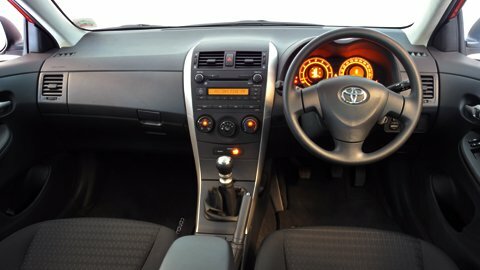 The Toyota Corolla is a small sedan, but an ingenious interior design, although not beautiful, provides loads of room for passengers, especially at the front. Many will argue that there is enough room at the front in almost any car, but you honestly have to see the space in the Corolla to see how surprisingly roomy it is when you have in mind the car’s size. The Corolla is a very comfortable car. Moreover, sound insulation is surprisingly good, so higher speed driving is pleasant. At the back some would argue that it is not very roomy, but it is decent and definitely at least as good as other cars in its class. I did get pretty tired during a travel once, but it was an all day affair and I think I’d be tired in almost any car. There are loads of storage spaces in the cabin. A large glovebox, and another one in the central console, along with large door pockets give more than enough options. The Toyota Corolla is also very safe. Many tests put her at the very top of the class and front airbags, curtain airbags and active front head restraints provide lots of confidence. The fuel consumption of about 6l/100km is awesome for such a large car and the sixth gear makes it economical even during faster runs on the motorway. The engine is a 1.3l petrol with 100 hp. It is capable of taking the car to about 180 km/h, so I can’t say it’s very slow, but acceleration is definitely not the Corolla’s strongest point. As you push the pedal hard you can see the small engine struggling. If your primary concern is not fuel consumption, go for a larger engine. 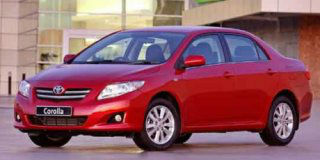 To be honest, the Toyota Corolla is not the prettiest car out there. This model was made in 2013, so it is fairly new and a result of many design revisions, but it is still pretty dull-looking. Similarly, on the inside, even though it is very roomy, the design is not very imaginative and the materials are not of the best quality. Even though the interior has loads of storage space, the boot could be a bit bigger. Altogether, the Toyota Corolla with this engine might be a good means of transport but it will definitely not make your blood boil.